The Victorian Parliament's Electoral Matters Committee has made 23 recommendations to improve the conduct of Victorian State elections in a report presented to Parliament today. 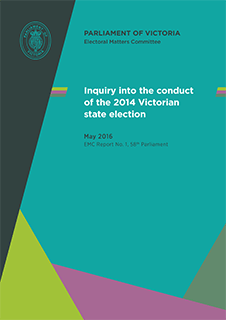 The report follows a detailed inquiry into the conduct of the 2014 State election. “The 2014 State election was extremely well run,” said Committee Chair, the Hon Louise Asher MP. Ms Asher said the Committee has supported proposals put forward by the Victorian Electoral Commission, but has also made recommendations for improvement based on other evidence it received during its inquiry. “Queueing was one of the particular concerns raised by members of the public, particularly in relation to pre-poll centres,” Ms Asher said. This is the third occasion on which the Electoral Matters Committee has presented a report about the conduct of Victorian State elections. “We hope this is a useful series of recommendations that will be acceptable to the Government in setting the parameters for the 2018 Victorian State election,” Ms Asher said.